Phone interview tips to successfully manage the telephone interview. Make a great impression on the employer and secure the face-to-face job interview. Use these practical phone interview techniques to ensure you are ready and confident when the call comes! Make sure you have a quiet place to take the interview call where you will not be disturbed. It should be comfortable to sit or stand and have a table where you can lay out your portfolio and papers. You need to be able to easily go through your documents and preparation, take notes and concentrate. Avoid a cluttered area where you can't find anything. If you are at work make sure you can talk freely. If you have a scheduled time for your telephone interview make sure all distractions are dealt with beforehand. Let the rest of the household know that you need a quiet period and not to interrupt you. If you receive the call unexpectedly, ask the interviewer for a moment to organize yourself and get rid of all distractions. If an interview call catches you at a really difficult moment it is in your best interests to try and reschedule it. Tell the interviewer you are unable to give the call the attention it deserves and suggest a couple of possible times that you can call back. You will not come across as disinterested but rather as a candidate who wants to maximize this opportunity. 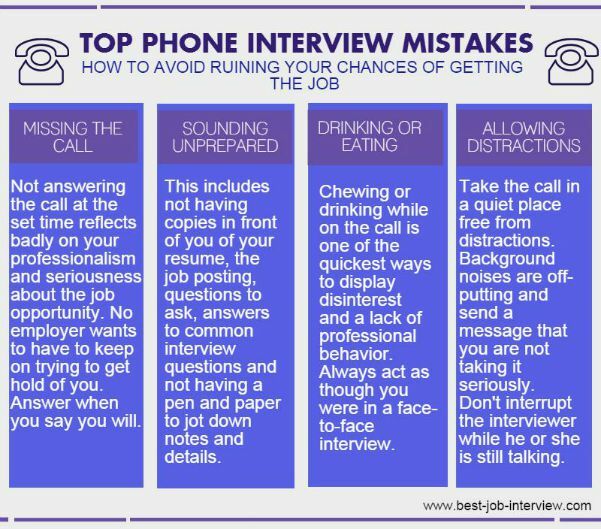 Be prepared for the common phone interview questions you are likely to face during the telephone job interview. Make a few notes about how you will answer these questions. The one advantage of an interview over the phone is that you can easily refer to your preparation notes! Use your company research to prepare a list of questions to ask during your interview. Have 4 or 5 good, meaningful questions ready. Make sure your posture allows for good breathing and voice projection techniques. Experts suggest that standing up during the phone interview makes the candidate sound more confident. However you should do what feels most comfortable and natural, keeping in mind you will want to refer to your notes and perhaps make notes too. If you do the interview sitting down make sure your posture is upright and attentive and not slumped down in your chair. Walking around while talking can cause breathlessness and takes away from the authority of your voice. This may sound like one of the strangest phone interview tips! Even though the interviewer can't see you, dressing smartly to take the scheduled call makes you feel professional and prepared. You will automatically act and sound more serious and business-like during the telephone interview if you are properly dressed. You don't have to put on a suit, just change your bathrobe! Use the interviewer's title and last name, Mrs Smith, unless they specifically ask you to call them by their first name. Be aware of your voice and tone. No smoking, chewing gum, eating or slurping coffee. However keep a glass of water handy so you can just wet your mouth and throat if they become dry. If you smile while you talk it will project a positive tone to the listener. Avoid "ers and ums", these are particularly noticeable on the phone. You can reduce this by having key words ready for your interview answers. 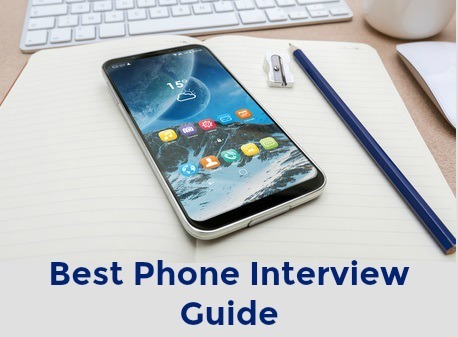 Phone interview tips always highlight that candidates fail when they dominate the conversation. Avoid interrupting the interviewer, make sure they have finished speaking before you start your response by waiting a few seconds before you answer. Allow yourself time to collect and organize your thoughts before answering. Use the technique of rephrasing or repeating questions to give yourself time to think about your answer. This is a common error made by candidates on the phone. Because they cannot see what the interviewer is doing during the silence they feel compelled to fill it with babble! If you have completed your answer and the interviewer is quiet it is probably because they are making notes or sorting through their questions. Allow time for this. Always try to include more information that highlights your suitability for the position. Answer with sufficient information to show that you are a suitable job candidate. Use these sample answers to help you develop good interview answers. 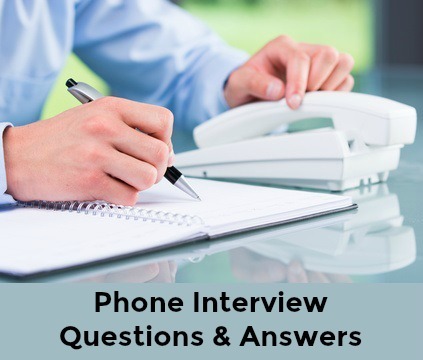 Phone interview tips for handling difficult questions. Go through your resume and job application and check for any red flags that you may have to explain, including gaps in employment and reasons for leaving. Get help with preparing job interview answers to these tough questions and don't be thrown during the interview. End off with a good question for the interviewer. Restate your interest in the company and position. Reaffirm your suitability and that you would appreciate an opportunity to discuss the job further and in person. If the interviewer asks you what salary you are looking for at the end of the phone interview you can reply by saying that you don't know enough yet about the job and company to realistically give a figure. This sets you up for the next stage. It is quite acceptable ask the interviewer what the time frame is for deciding who will progress to the next stage. Close the interview on a positive note and leave the interviewer with the right impression. Make a note when to follow up and hang up only after the interviewer has. 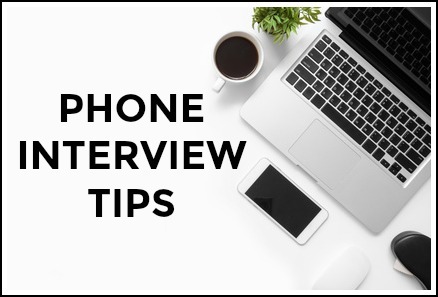 Essential phone interview tips include sending a phone interview thank you email. Immediately after the phone interview send a thank you either by post or email. Make sure you get the correct name of the interviewer, check with the company switchboard if you are unsure. Something along these lines would be appropriate. "I appreciate the time you took on the phone with me today. I enjoyed our discussion and look forward to learning more about the position and company at an on-site interview. Thank you for your efforts and I look forward to hearing from you." This phone interview follow up email will help you with your follow up. Make sure you get the phone interview right.